Does the 2016 Toyota Camry Price Give Drivers as Much as the Honda Accord? When shopping for a new midsize car, Central Illinois drivers know there are quite a few options available, and before settling for the 2016 Toyota Camry price, you should look around to see if you can’t find a similar—or better—selection of features for a lower price. We want to compare the new Camry to the 2016 Honda Accord Sedan to give you an idea of what we think a midsize sedan should give to their drivers. The 2016 Toyota Camry LE has a base price of $23,070 without any upgrades. While the savings of the Accord LX CVT over the Camry might seem small, would you believe that the Accord is also more fuel efficient for long-term savings? The 2016 Toyota Camry only manages 35 highway and 25 city mpg for 28 mpg combined city/highway. 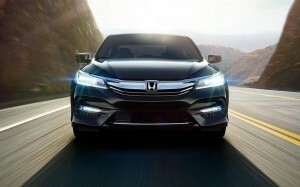 Honda gives drivers savings on top of savings, but that’s not all. You can find features like dual-zone automatic climate control, a multi-angle rearview camera, a stereo anti-theft system, and a set of alloy wheels as standards on the Accord. The Camry would require upgrades for even a set of floor mats, let alone alloy wheels or an advanced rearview camera like the Accord’s. The best way for you to see what the 2016 Honda Accord has to offer for its price is to get behind the wheel for yourself. Visit a Central Illinois Honda Dealer near you today for a test drive and let us show you what the Accord is capable of. While even the basic LX trim is impressive, don’t forget that there are five more trims available above it. **Based on 2016 EPA mileage ratings. Use for comparison purposes only. Your actual mileage will vary depending on how you drive and maintain your vehicle. Central Illinois Honda Dealers includes Bob Brady Honda, Bob Lindsay Honda, Brad Barker Honda, Carmack Honda, Roy Schmidt Honda, Honda of Illinois, and Honda of Champaign. 0 comment(s) so far on Does the 2016 Toyota Camry Price Give Drivers as Much as the Honda Accord?